The Exley Science Center desk of Associate Professor of Physics Tsampikos Kottos is crowded. Very crowded. But the equation-scrawled papers are about to multiply. Last June, Kottos and his colleagues at a consortium of universities across the country were awarded a $7.5 million grant from the Department of Defense to study optics, and research began in full in January. 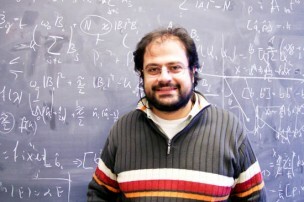 Kottos, a theoretical physicist, works with models to understand wave transport. For the Department of Defense, Kottos and his colleagues’ eventual goal is to develop new proposals for materials in optics. “The specific grant deals with a new type of materials, Parity-Time materials, that have strange properties,” Kottos said. Parity-Time materials exploit losses. Losses, Kottos explained, are a reality for all physicists. Most try to minimize them, while theoretical physicists like Kottos attempt to simply discount them when solving equations. In 2010, though, Kottos and his colleagues were among the first groups to attempt to manipulate, rather than obliterate, losses. Related to that research is Kottos’ work with the optical isolator, a device that allows the flow of light in one direction while blocking it in another. Kottos, who works in the theoretical, is nonetheless compelled by potential applications. The optical isolator that Kottos and Professor of Physics Fred Ellis have proposed has existed for 30 or 40 years now. The problem is that the devices are big and bulky. The consortium of five other universities with which Kottos partners includes the University of Central Florida’s CREOL College of Optics & Photonics, Rice University, Massachusetts Institute of Technology, Georgia Institute of Technology, and University of Utah. Within the six universities, Kottos and his Wesleyan colleagues are the only theoreticians. The prototype of the optical isolator will be assembled at CREOL; the materials will be developed at Georgia Tech. Kottos’s Wesleyan team consists of two undergraduates, two graduates, and, by the end of the summer, two post-doctorates. He is on the lookout for new undergraduates to join the project; it has been a goal of the department to offer more optics opportunities to undergraduates. When asked whether he has any ethical reservations about conducting research that has potentially violent applications, Kottos chuckled. He added the goal of the grant isn’t to develop one specific device. Theory, though, is where much of the great work lies, according to Kottos.